This photo shows C.C. Harris, a towerman, leaning up against the tower in 1907 before the structure was expanded. Tower 17 was "authorized" by the Texas Railroad Commission on July 23, 1903. Tower 17 controlled the crossing of the Gulf Colorado & Santa Fe Railroad (Santa Fe) and the Galveston Harrisburg & San Antonio Railway Company (Southern Pacific). The tower's function was to house the electro-mechanical interlocker, and the men whose job it was to operate the interlocker, which was a machine (shown below) that controlled the railroad signals and switches, setting the route for any train passing through Rosenberg. Only one route could be set up at any one time, which helped to prevent accidents by allowing only one train through the crossing at a time. The electromechanical interlocker was, essentially, a 19th century analog computer using mechanical switches instead of the 1s and 0s used by today's digital computers. The current exterior paint scheme is based on Southern Pacific Standards Book information and from paint scrapings gathered from Tower 17 itself. The colors closely match those used at the time this photo was taken. Tower 17 received a new paint job, and with its original Southern Pacific Standard colors, it looks as good as the day it was first built. The towerman's job was to allow only one train at a time through the crossing, and the interlocking machine shown below facilitated this function. When the telegraph operators/clerks were transferred from the Rosenberg depot to Tower 17 in 1955, the building was enlarged to its current size. The tower was in service until February 10, 2004 and was dismantled and moved approximately 1/2 a mile to the Rosenberg Railroad Museum, where it has been restored. The towerman used a reference board which showed which levers had to be pulled in exact sequence to line up the route. To set up a different route, the towerman had to "take down" the existing route by pushing in the levers in the exact reverse order in which they had been pulled. This reset the interlocking machine and then the new route could be aligned. Although more advanced technology was connected to the interlocking machine, it basically functioned in the same manner for over 100 years! In 2004, the Tower 17 interlocker was one of the last to be replaced by a modern computer. Today, all such railroad intersections are controlled by computer. Today's computers are sealed in bright aluminum boxes to protect them from the weather. Because of this, the once common interlocker towers were no longer needed, nor were the towermen who worked in them. Tower 17 was kindly donated to the Rosenberg Railroad Museum, moved to the museum, and restored to its original glory. When you visit the Rosenberg Railroad Museum, you can operate the interlocking machine just as the towermen did! Interior of Tower 17 as it appeared in the last days of active operation. Jim Vollmer describes to museum visitors some of the duties of the Towerman and shows the original equipment they used in Tower 17. Tower 17 interior as it prepares for renovation in early 2015. 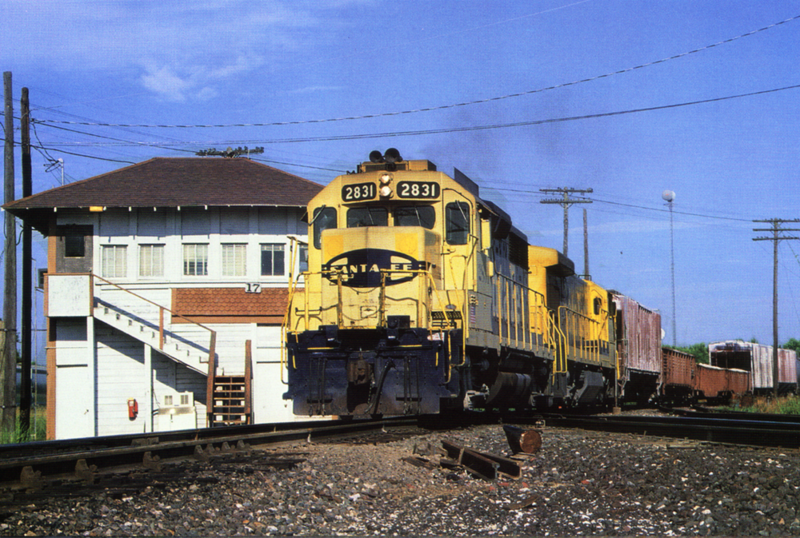 The Rosenberg Railroad Museum has been chosen as a regional location for an Advanced Train Control System (ATCS). ATCS is a system of railroad equipment (hardware and software), designed to ensure safety by monitoring locations of trains and locomotives, providing analysis and reporting, and automation of track warrants and similar orders. This system, as used at the museum, allows us to monitor in a graphic format, the real-time movements of trains in the Union Pacific Glidden subdivision (which includes traffic behind the Museum) on a large hi-def monitor. The BNSF Galveston subdivision will be added in early 2014 and a second monitor will be added to the system. You can view signal indications for absolute signals, switch alignment, and whether or not a train is occupying a section of track. You will see a train as it approaches and passes by the Museum and watch the monitor to see how it switches along the track. This interactive system is available now in Tower 17 for all Museum visitors. Future plans for viewing the ATCS include adding the live action to a Museum Members Only section of this website. We will soon have more information available, so please check back with us. If you have any questions about the system, please contact us.